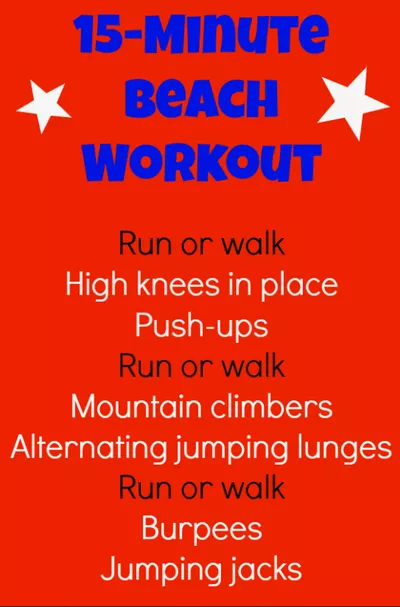 If you're heading to the beach this July 4th weekend, here's a quickie workout to take with you. Exercise on a holiday weekend? I'm sure you don't want to spend a lot of time working out, but exercising on the beach is a lot of fun and challenges your body at the same time. The sand provides an uneven and unstable surface, which makes working out more challenging because your body has to work harder to balance, which means you'll burn more calories and give your body a seriously great work. Additionally, the sand provides some cushion for your joints, so running and jumping is lower impact, which puts you at less of a risk for injury. For this quickie workout, start out by running or walking briskly on the beach for 3 minutes. (Use a timer on your cell phone to keep track.) Stop and do high knees in place for one minute and then do as many push-ups as you can for one minute. Run or walk again for 3 minutes followed by a minute each of Mountain Climbers and alternating jumping lunges. And, finally, run or walk for 3 minutes and finish with a minute each of Burpees and jumping jacks. Try to move from one exercise to the next for maximum calorie burn, but, of course, work at your own pace. Complete the entire circuit for a 15-minute workout or twice for a longer 30-minute workout. When you're done, cool down by taking a dip in the ocean! Unsure of how to do some of the exercises listed above? Check out this post, which includes exercise how-to videos and even more do-anywhere workouts!